Headquartered in Singapore, Boomzap Entertainment has developed and published over 40 various casual game titles on multiple platforms. After finding success with Hidden Object Puzzle games, Boomzap decided to try their hand at a turn-based strategy game with Legends of Callasia. Originally dubbed Legends of Fire and Steel, the project offered a game easy enough for casual players to pick up quickly, but still satisfying for long-time strategy fans. They launched a Kickstarter to secure some additional funding and to put their game into player’s hands for insight and feedback as early as possible in the development process. The campaign ultimately did not meet it’s goal, but Boomzap did manage to cultivate a group of about 100 backers who were really excited about the project. Backers who had pledged toward the first project were all granted exclusive access to the game’s first closed beta. They were also given 5 additional codes so they could bring their friends along to try out the multiplayer functions. A few months later, armed with invaluable player feedback, Boomzap launched a new Kickstarter for the renamed, Legends of Callasia. 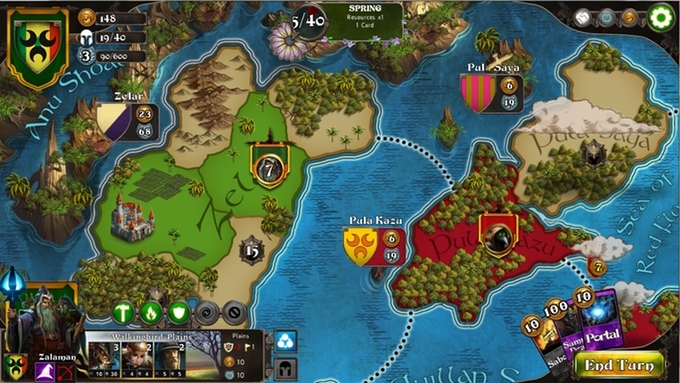 The new campaign featured a playable demo and better explanations of the game’s unique simultaneous turn-based multiplayer. It did better, but it still wasn’t able to acquire funding. Speaking with Boomzap co-founder Chris Natsuume recently at PAX South, he explained that, while a solid title, Legends of Callasia didn’t break enough new ground to garner the attention needed to succeed in crowdfunding. Understandably, the team was feeling a bit fed up with the crowdfunding model at this point. Still, they had managed to get the game Greenlite on Steam thanks to the support of their community. Despite not having a publisher to fund development, Boomzap continued working on Legends of Callasia. Shortly after the second Kickstarter the game launched on Steam Early Access. Natsuume said that this is when the power of community advocates really began to stand out. “There is a real magic to early access and live streaming,” Natsuume said. The team began to regularly stream development progress on their Twitch channel. The community was invited to watch and comment on the process of Legends of Callasia’s development. This interaction allowed Boomzap to develop an active relationship with a small, but fiercely dedicated community around the game. A community which ultimately lead them back to Kickstarter. Natsuume said he had no plans to go back to crowdfunding at this point. However, the fans had a different idea. When Boomzap announced that they were planning an expansion for Legends of Callasia, it was the fans who asked them to take the project back to Kickstarter. The community wanted to help bring the game they loved to life, and score some exclusive rewards in the process. Legends of Callasia: The Stoneborne Kickstarter campaign launched in July of 2016. Seeking $2,500 the project would add some of the most requested new features into the game: additional factions, heroes, cards, and maps. With the help of 117 backers, the campaign easily surpassed its funding goal. Again, Natsuume stressed the importance of having a small, yet relative fanatical user-base. He estimated that 80% of the expansion’s backers already owned the base game. As most of the developers I spoke with at PAX pointed out, the first day on Kickstarter is critical to a project’s success. Having a community who feels invested and ready to support your project can make all the difference between success and failure. Boomzap is currently working on another strategy game. One they hope to premier at PAX East later this year. Natsuume said he isn’t 100% sure if they will return to crowdfunding for the new project just yet. Regardless, Boomzap now has the community support they need to continue making the games their fans want to play.